We work very hard to provide a quality rental product. We do not add on excessive handling charges to our rentals. Many times the shipping charge does not cover the cost of the actual shipping. We spend many hours cleaning and preparing our rental costumes. Please make your selections carefully. All rentals must be done over the phone with a valid credit card number. We DO NOT offer refunds on rentals. This includes events where your party was cancelled, you became sick, or because you provided us with inaccurate measurements. 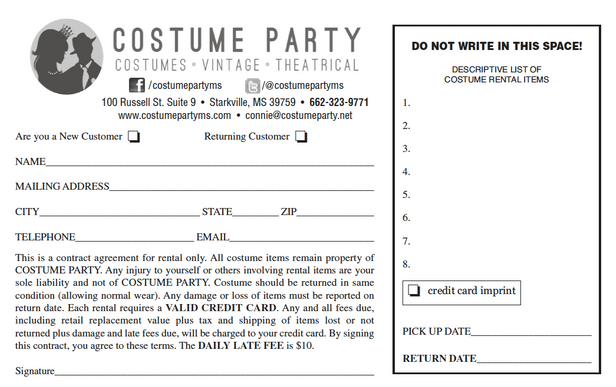 If your costume doesn't fit because of our error, we will gladly send you another selection. Thank you for understanding. Please see below for our rental policy which applies to items rented in the store and over the phone.